To use TXTextControl v25 away from Visual Studio, the machine running the code needs Visual C++ Redistributable Packages for Visual Studio 2013 installed. In a lot of cases this may already be in place, but in others (e.g. 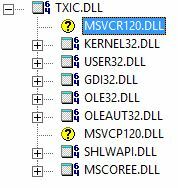 Azure VMs running Server 2012 R2 and Azure App Services), then this won't necessarily be the case, resulting in "Could not load file or assembly 'txic.DLL' or one of its dependencies. The specified module could not be found.". It would be helpful to add this dependency to the help topics regarding distribution, especially "Distributing a TX Text Control .NET Server Project" and possibly "Redistributable Files".